WHO CAN I TRUST FOR MY AIR CONDITIONING REPAIR IN CALGARY? Although Calgary isn’t necessarily known for scorching temperatures, when the heat does hit each summer, it feels great to walk into a cool, air-conditioned house. The ability to keep your home at a comfortable temperature during the summer helps everyone feel better and lets you and your family sleep well even in the heat. A good AC system also can help cut down on seasonal allergies since you don’t need to rely on open windows to cool down your living areas. And Calgary businesses love having air conditioning in their buildings to ensure their staff and clients are comfortable inside no matter the temperature outside. But what happens when that wonderful AC quits working? How do you know which air conditioning repair companies will do an excellent job for you? 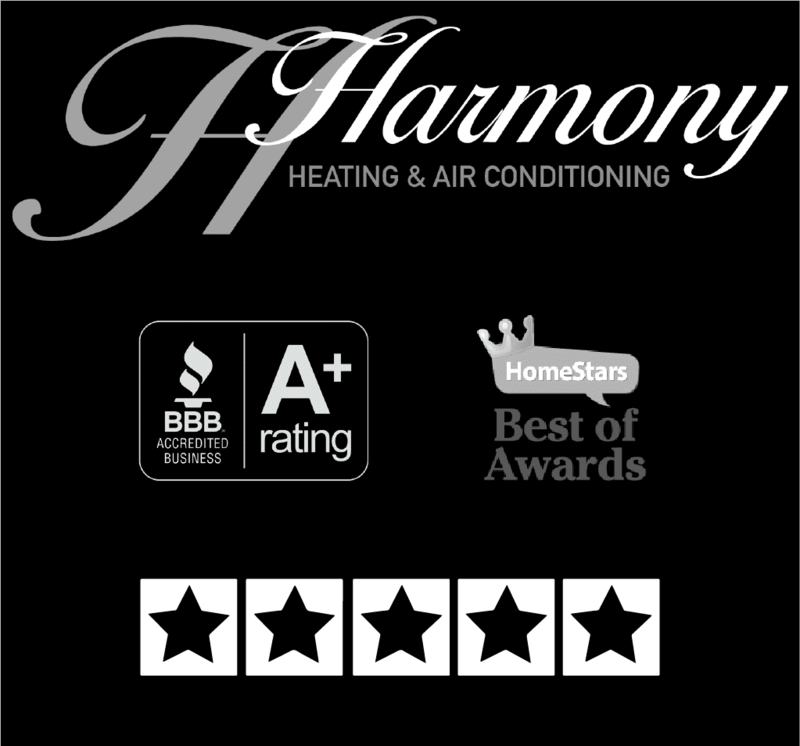 With years of experience serving the Calgary community, Harmony Heating and Air Conditioning is the area’s go-to HVAC expert. If you need air conditioner maintenance, repair, or replacement we can help. Our friendly experts are ready to serve. If you are eagerly dreaming of warm summer days after our cold Calgary winter, this is a perfect time to check your AC unit to make sure it is functioning correctly. It is easier to schedule air conditioning repair services now before the temperature starts rising. Go ahead and give your air conditioner a chance to run for a while and pay attention to what you see, hear, and feel. Your AC system shouldn’t make you feel like you’re standing on a runway at Calgary International Airport. If it is really loud while the AC runs, you likely need some service to the unit. Surprising no one, the temperature in your home should go down when the AC unit runs. If the temperature doesn’t drop, it’s probably time for some air conditioning maintenance. What Is Involved in Air Conditioning Maintenance? Each year before the hot weather arrives, you should invest some time in routine air conditioner maintenance. When done correctly, this process will prolong the life of your AC unit and ensure that it works efficiently, saving you energy and money. The exterior condenser/compressor: Our technicians will inspect the fan, fins, and cage for damage and debris. We clean out leaves and sticks and other items that may have found their way inside the unit. If fins are bent, we will straighten them for maximum efficient airflow. The pad: Over time, the pad your condenser/compressor sits on can tilt as the soil beneath it settles. When the unit goes out of level, your air conditioner is likely to fail. We also will make sure to clear debris away from the unit. The evaporator coil: The Harmony team will brush and clean the coil to ensure efficient functioning. We will check the evaporator drain for blockages to make sure it is working properly. The filter: The blower filter is often one of the most overlooked steps in homeowner maintenance tasks. Ideally, you should replace the filter about every 30 days, but many people forget all about this step until there is a problem and they need air conditioning repair. Our staff will check this and replace the filter if needed. The thermostat: If there is a problem with the “brains” of your AC unit, we will take care of that too. After all, your air conditioning can’t work at all without a functioning control center. For both residential and commercial cooling needs, Harmony Heating and Air Conditioning is here to help. For everything from routine service to extensive repairs to complete replacement and installation, our experts will get the job done promptly and professionally. We can work on central air conditioning units, ductless mini splits, and fan coil units as the job requires. Plan now to get your cooling system in tip-top shape before the summer heat comes into town. Our service technicians are ready to serve you. And if you’ve never had AC before and are ready to take the plunge, we can do that for you too. We are expert installers for all the major brands, including Lennox and Trane. We’ll have you ready for the summer in no time at all.